A photograph of the Korean Peninsula at night taken by the astronauts at the International Space Station shows the darkness of the Hermit Kingdom. The picture (below), taken on Jan. 30, 2014, show the shining lights of South Korea (bottom right) and China (upper left) with an unusual area of darkness separating the two countries. That darkness is none other than Kim Jong Un’s North Korea. The darkened land appears as if it were a patch of water joining the Yellow Sea to the Sea of Japan. The little spot of light, looking like a dim star in the darkness is the light’s of the capital of Pyongyang, a city of 3 million. 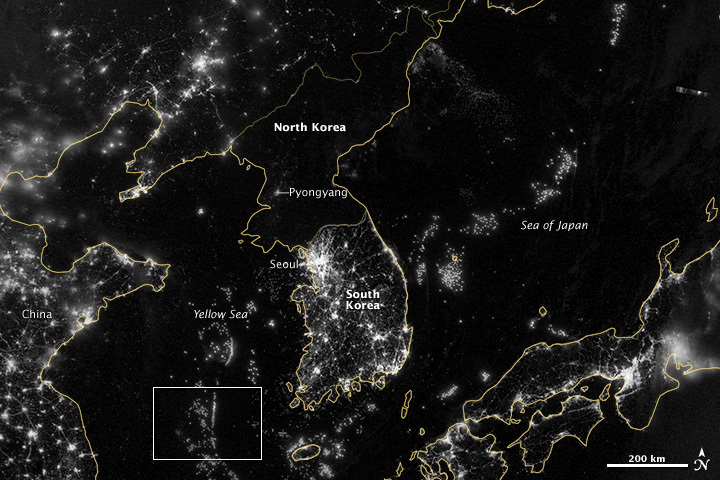 NASA compares the light from Pyongyang to the light emitted from smaller towns in South Korea. The LA Times reminds us of Laura Ling, a journalist who was imprisoned in North Korea, wrote about the nation and creeping change in 2012 in the L.A. Times. She noted that North Korea was as “isolated and backward” as South Korea was “wired and technologically advanced.” The average North Korean, she said, has no knowledge of YouTube, Facebook or Twitter. Not much has changed in two years. 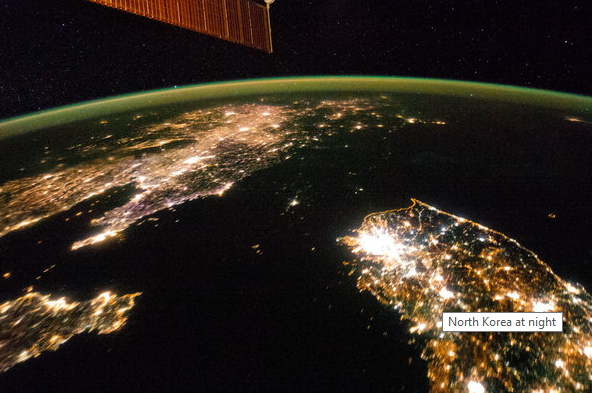 A NASA photo from Sept. 24, 2012 reveals exactly the same light emission, or lack of, in the Hermit Kingdom despite Kim Jong Un’s recent boasts of world-class development projects.